How do I: find scholarly websites? Google offers an Advanced Search option, which allows you to search for scholarly web sites more efficiently. 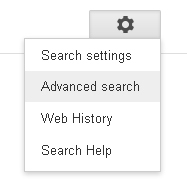 To access the Advanced Search interface, conduct a search in Google using the search box below. To the right of the search results in the upper corner, you will see the settings button. Click on this icon and select Advanced search from the menu. Once in the Advanced Search you can limit your results to particular domains, such as .edu, .gov, and .org. This will help eliminate commercial sites from your results and focus on more scholarly web sites.